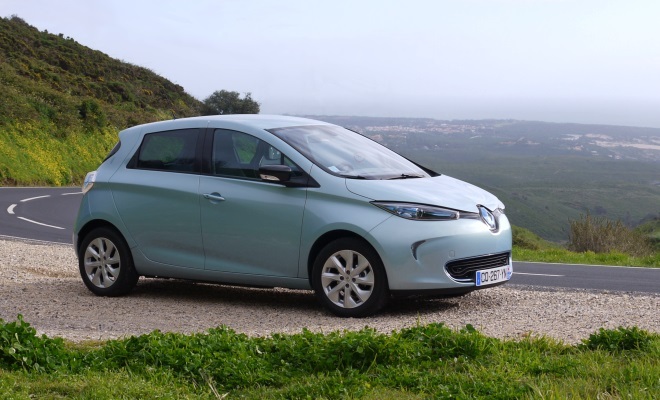 The route that Renault has carefully programmed into the satnav of our Zoe electric car climbs up into the hills above the town of Cascais in Portugal. But just as the settlement begins to thin, the course mapped out on the screen curves around on itself, heading back towards narrow streets and a looming appointment with a hotel carpark and a charging cable. “Turn left,” repeats the insistent voice from the centre console, as I sit motionless at the junction. I check the range prediction in the slim blade of the digital instrument panel. 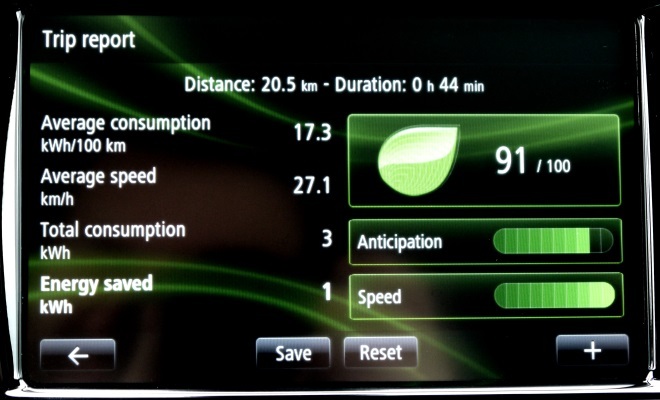 There’s still almost half of a full 90-mile charge remaining – a very comfortable margin to play with. So I decide not to do as I’m told. I switch the nagging voice off and go right. It’s a good decision. We’re soon following a rippling black ribbon of tarmac flanked by lush green slopes, rising high above us on one side and rolling away towards a distant smudge of ocean on the left. The surface is smooth, the corners frequent, the scenery magnificent and the traffic sparse. It’s a dream combination. Or it would be if Zoe were a little more obliging. I’ll come back to this road in a moment. First, let’s run through how we got here. The main impression that strikes, clapping eyes on Zoe at Lisbon airport, is how neat and pretty the car has turned out. It may have piercing headlamp eyes and a gaping maw at the front, but the overall impression is more angry Pokémon than hungry predator. That’s probably a result of the oversized Renault logo, covering the central charging port at the front. It gives the car a cute, button-nosed look. At the rear, diamond-shaped lamp clusters catch the eye with their blue-tinted intricacy. The curve of the rear windscreen above is a little contrived, sweeping into curves of black plastic fakery at either side, no doubt designed to make the car appear wider and less tall from the rear. But the rest of the car looks clean and attractive, mixing plump and lean surfaces to great effect. Zoe is a practical five-door hatch but the rear door handles are concealed in the window frames, providing another questionable little detail. Having first spotted their hiding place you have to press a thumbprint indentation to flip open the handle, then slip your fingers under the flap to open the door. If you buy this car, be prepared to explain how to get in to everyone you ever offer a lift. Once aboard, the interior feels light, spacious and airy. A little too light, to be honest. The pale upper surface of the dashboard reflects strongly in the windscreen in bright sunshine, while its shiny surface can even bounce sunlight straight into the driver’s eyes if the angles line up badly. Sunglasses will be essential in the summer. The interior materials are nothing special – mostly unyielding plastic and canvassy cloth – but the pieces have been put together well and designed to look clean, practical and modern. It feels like Ikea crossed with Apple in here, an impression reinforced by the glossy slab of the centre console. 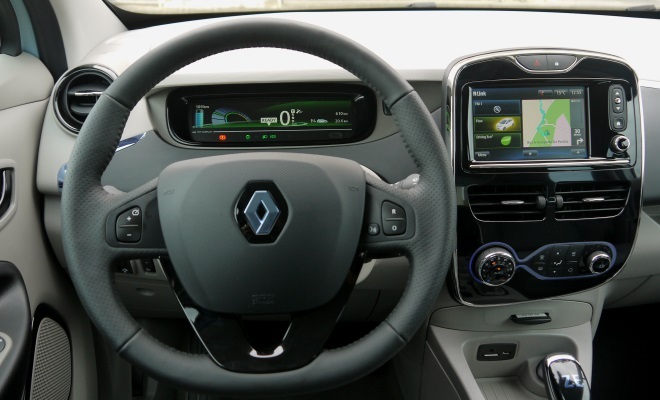 All Zoe models get the same seven-inch touchscreen with Renault’s R-Link multimedia system, providing voice-controlled TomTom navigation plus USB, Bluetooth and SD-card connections. Headroom in the rear is tight, a consequence of stadium-style seating, while even the front pair of seats feel quite high-set and can’t be cranked downwards. The seats, of course, sit atop the battery, a 290kg oblong mounted low in the middle of the car, stretching forward under the front seats and bulking up into a double layer of cells underneath the rear bench. The battery pack stops short of the rear axle, leaving a well-shaped 338 litres for luggage at the back – a better than average boot for this size of car. The battery is an actively cooled lithium-ion unit made by LG Chem in South Korea. It stores 22kWh, or about 10% less than the capacity of a Nissan Leaf, and feeds power forwards to a 65kW (87bhp) electric motor, propelling the front wheels. Official tests indicate an impressive 130-mile range but Renault sensibly suggests 90 miles is more realistic in mild weather, dropping to 60 miles in winter. I never ran the battery particularly low, but the ranges covered and the reserves remaining suggest that Renault’s estimates are on the cautious side. Putting energy back into the cells can be done using a broad variety of AC supplies, with Renault’s “Chameleon” charger able to work with power levels from a domestic 3kW socket to 43kW dedicated fast charger. 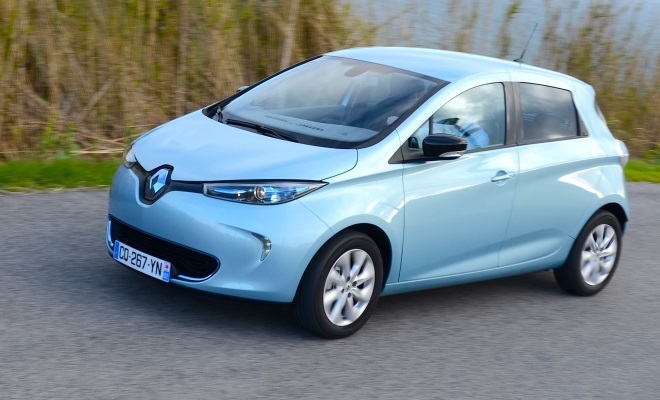 The former might take nine hours overnight to recharge the Zoe from a low state, the latter can manage 80% in 30 minutes. During our test drive we used a 22kW socket in a carpark to go from half-empty to full in about an hour, while we stopped for lunch. UK buyers will get a 3.8kW home-charger wallbox supplied and fitted free of charge, courtesy of Renault and its partner British Gas. At the end of each drive, the centre console provides a summary of the journey complete with scores for the driver’s use of speed and anticipation, which you are free to ignore, of course. Back on the move, there’s only one forward ratio, but performance feels brisk as a result of a diesel-like 220Nm of torque at low speed. Not that it feels like diesel power – the electric motor is so quiet and free of vibration, the sensation of acceleration seems more like the force of gravity than anything mechanical. 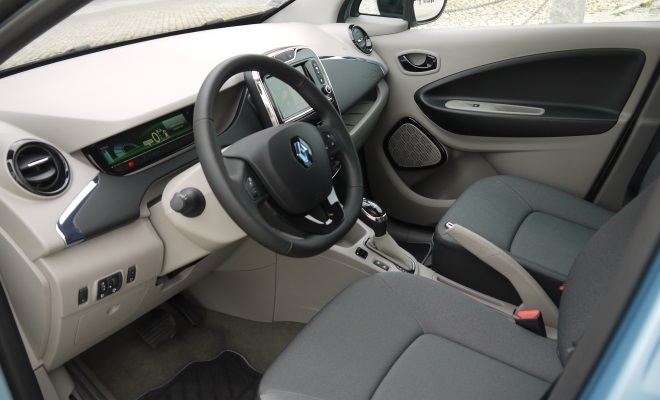 Using the optional Eco mode – press the button down by the gearstick – will help to extend range by as much as 10%, at the expense of blunted throttle response and less attentive heating or aircon. I found Eco mode perfectly acceptable, but a lot less fun than standard mode. The stopwatch may say 13.5 seconds to 62mph, but given a sharp prod the Zoe feels fast and eager almost up to its 84mph limiter. You can overtake slower cars on country roads without fear. Sadly the brake pedal doesn’t produce quite the same reassurance as the accelerator. The balance between hydraulic and regenerative braking is controlled fluidly by Zoe’s electronic systems, to try to regain as much energy for the battery as possible. As with other plug-in cars adopting a flexible-regeneration approach, the pedal feels a little woolly as a result. Regeneration is always phased out just before the car comes to a complete halt, and the resulting change of response makes it quite difficult to bring the car to a smooth rest. There’s always a bit of grabbiness in the final half-second of braking that makes Zoe lurch rather than glide to a full stop. The rear brakes are drums rather than discs, and they’re not always the quietest companions in slow speed manoeuvring, producing a surprisingly vocal catalogue of creaks and groans on some of the steep, cobbled streets of our test route – made more obvious by the lack of engine rumble. At other times, Zoe could do with making a bit more noise. A pedestrian alert is fitted, which generates one of three selectable warning sounds between 1mph and 18mph, all of which sound like different varieties of vacuum cleaner. The problem is that nobody associates electronic hums, whirs and warbles with the presence of danger out on the streets. I lost count of the number of people and pigeons that stepped casually off pavements and into our path, only to jump out of their skins when they finally noticed the car trying gamely not to run them over. It’s a relief to leave narrow city streets behind, even if they are the most natural habitat for electric cars. Which brings us back to our hillside road, all sweeping twists and turns and warm spring sunshine. Alas, the picture is not perfect because despite impressive urge, Zoe really isn’t a hot hatch. 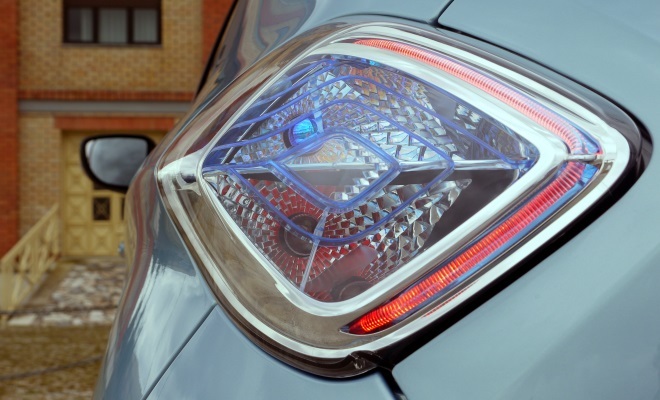 The steering becomes rubbery and imprecise in fast turns, braking feels soft and vague, and the Energy E-V tyres – specially developed for the Zoe by Michelin – may add six per cent to the battery’s range but they must subtract at least that amount from lateral grip. Swing enthusiastically into a bend and the rubber starts complaining, not by squealing but with a scraping noise and a gentle slide into understeer. Buyers can choose optional 17-inch alloys, which come with conventional Primacy 3 tyres, trading battery range for grip. But a better answer is simply to slow down, enjoy the peaceful absence of noise, vibration and stress, and start travelling with one elbow stuck out of the window. 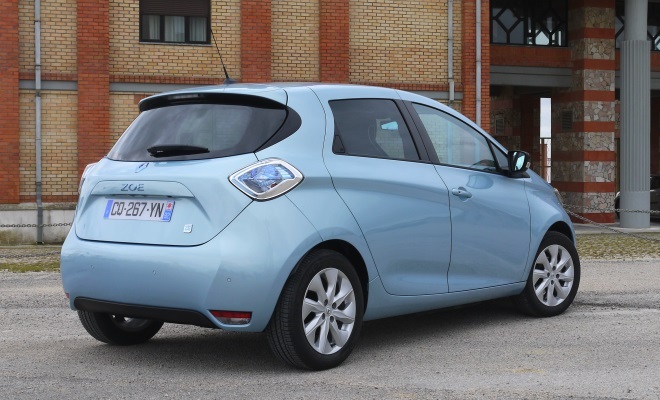 As my very pleasant test drive in Portugal proved, Zoe is an extremely competent electric car, but it’s not perfect and comes with various well-signposted limits. Its most attractive feature is its price tag, starting from under £14,000 after the government’s Plug-in Car Grant, or about half the price of a Nissan Leaf. There is the slight snag of paying for the battery, of course, which Renault leases from £70 per month on top of buying the car. That sounds like slightly more than the average supermini owner probably pours into the tank every four weeks. 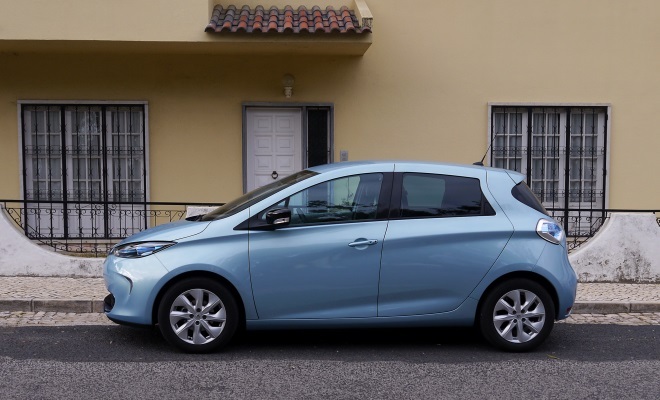 But when all is totted up – including four years’ free servicing and roadside recovery – Zoe’s running costs ought to land in roughly the same ballpark as any other vehicle of its size. If you want to go electric, but aren’t made of money, this is exactly the car you’ve been waiting for.